SnowAffair offers instruction, events, and adventures in the fastest growing snowsports on the planet. Snowkiting, Backcountry riding, and Telemark skiing. SnowAffair discusses snowkiting with the Prime Minister of Pakistan. This is the real deal. SnowAffair expands its business to include multiple Backcountry Adventures while still keeping its core snowkiting and TeleFair telemark skiing clinics. 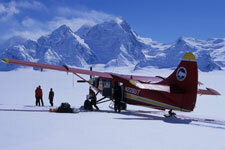 SnowAffair is featured in 6-page Men’s Journal story on our Alaska Backcountry Adventure. "SnowAffair is the athletic, poster-child for mountain-high sexuality." "We have seen skiing’s future. SnowAffair’s snowkite and telemark clinics are the hottest new trend over the next few years." What is SnowAffair? It is an exciting tour of events, clinics, and adventures that span the globe. Our passion is turning people on to the sports we love. 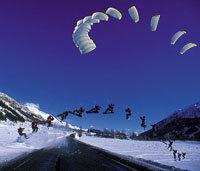 We specialize in backcountry adventures, snowkiting, and telemark ski clinics. SnowAffair has the highest quality telemark ski instruction using the latest generation of equipment to get you ripping fast. Our Snowkite Rallys offer free instruction, use of kites, and riding with the growing snowkite community. The Backcountry Adventures allow you to ride in places beyond your imagination. Recent trips include: Pakistan, New Zealand, Iceland, and Alaska. Come ride with us! These trips offer the opportunity to ride in a truly unique location while at the same time experience a once in a life time adventure. SnowAffair trips have included skiing in the largest US National Park, snowboarding in Pakistan, snowkiting in Iceland, and backcountry riding in France. These adventures focus on quality fun rather than extreme conquest. The unique locations, combined with cutting-edge action sports create a mind-blowing experience. Step up to the challenge of participating in a true adventure. Click here for Event Info. people. Add to this, Free instruction from certified teachers. Imagine riding untracked powder all day long while being effortlessly pulled along by a kite. Snowboarders, alpine skiers, and telemark skiers are all welcome. Come out and be part of the frenzy created by this explosive new sport. Click here for Event Info. The SnowAffair Telemark Clinics are known throughout the ski world for providing the best telemark instruction. We have been teaching for over 10 years with some of our students graduating on to compete with the US Telemark Team, to ski in telemark films, and grow to become gurus of the backcountry. Our teaching technique will give you confidence to ski any slope in any conditions. The clinics are designed for beginners through advanced skiers. Snowboarders comprise many of our clients. We use only the best gear in our demo program and it is provided free to all SnowAffair participants. Click here for Event Info. Copyright © 2007 (SnowFair). Design by Andreas Viklund.